A slovenly display of the tintypist's art. Shameful that this gentleman's compact mustache be given such short shrift. This is not insightful. I just love this blog. Amazing. Great work! Uh, I meant that my *comment* was not insightful! 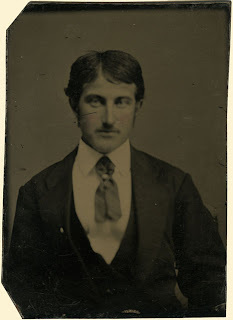 The blog, in and of itself, is a penetrating kaleidescope of the many faces of the mustache. A much-needed reference, frankly. Somehow this guy reminds me of Trent Reznor. Stache, the pomade you use has addled your brain. He is clearly a patrilineal forefather of Sean Penn.